We've just returned from a mini vacation to Falmouth MA. This is a favorite spot for the Emerging Runner family and we've been going there for years. The last two times we've visited the Cape, I've taken advantage of Falmouth's Shining Sea Bikeway that goes 10.7 miles from North Falmouth to Woods Hole. Yesterday I covered 4.2 miles of the path and saw some beautiful sights. 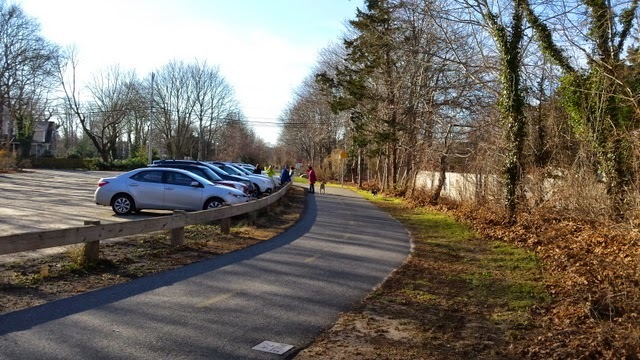 The trail was created along the former Plymouth and Vineyard Sound Railroad line that was built in 1861 to run trains from Sandwich to the southern tip of Falmouth. Train tracks are usually constructed on level terrain so the converted bike trail is fairly flat. While the trail did gradually slope up and down at various points, the grade was small. This made the shifts in elevation barely noticeable. Getting to the trail is easy with numerous access points along the way. Last year I entered at the northern trail head and ran a five mile out and back route that brought me through a few cranberry bogs. Yesterday I entered the trail farther to the south where I could park my car and jump right on the path. It was similar to how I access the Bethpage trail after parking on Colonial Road. 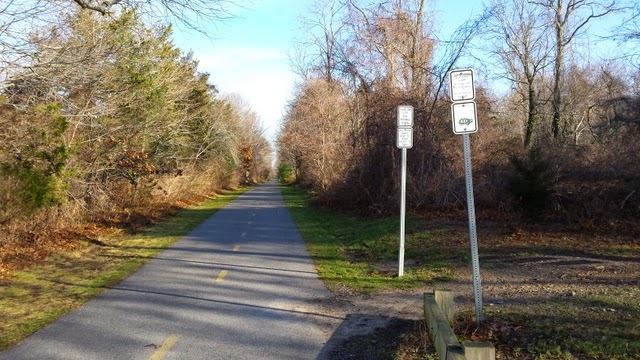 The Bethpage trail is scenic, but the Shining Sea Bikeway provided some truly stunning views. Soon after I started, I saw what appeared to be a dog sitting on the side of the trail wearing a yellow jersey. When I got closer I realized it wasn't a real dog. 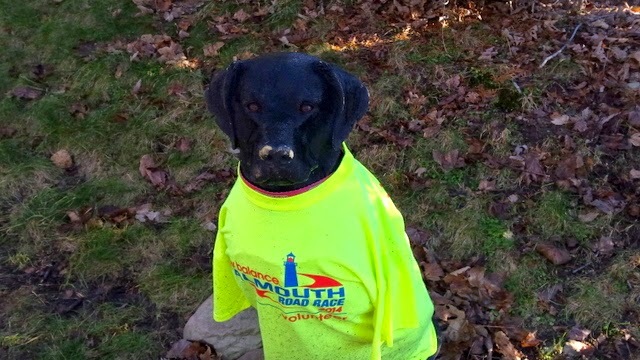 I was amused to see that jersey was an event tee from the famous Falmouth 7 Mile road race. Not long after that, I saw the first of many ponds and marshes that appeared along the trail. 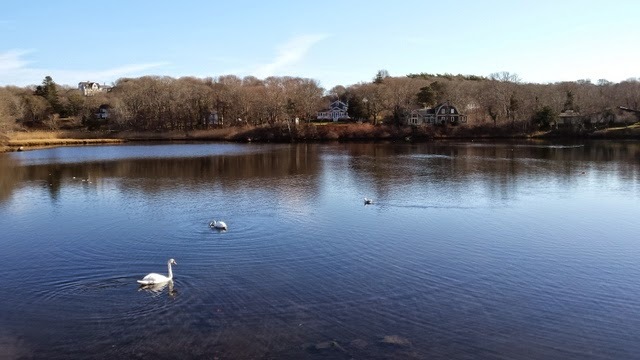 The areas that didn't face water were densely lined with trees on both sides, making the experience more intimate than Bethpages's more open space. I imagined that this all looks pretty much the same as it did 100 years ago to people riding the train to Woods Hole. There were a lot of people on the trail yesterday morning walking, riding and running. My route took me to the mid-point of the trail, where I turned around and headed back. If I'd had more time, I would have added a couple more miles. The straight flat trail made me feel like I could run all day. The only downside of this workout was that it amplified the soreness I've had over the past few weeks. We did a lot of walking yesterday and I was concerned that I had re-aggravated my injury. Instead of running when I got home this afternoon, I went for a 3 mile walk around the neighborhood. So far so good. If it's better tomorrow morning, I'll try to go out for a few miles in the morning. I have an early obligation so I'll need to get out before sunrise to fit it in. I wish I could run on the Shining Sea Bikeway again, but that will have to wait until our next Cape Cod visit. We always do an overnight in Falmouth on our way to Martha's Vineyard. Next time I will definitely check this trail out. I'm hoping to do 11 tomorrow at Bethpage. Are you guys around? I would love to join you tomorrow but Stillwell beat me up today and I need a recovery day so I can handle the Hangover on Thu. Looking forward to seeing you guys then!